Greetings travelers. In this first entry of a two part series exploring some of the various possible concepts of “home” in the Star Citizen universe, we’re going to take a look at an aspect of the game that is most familiar to us as humans, but a revelation for Star Citizen fans: the planets. There‘s no question that the scale of Star Citizen’s development has evolved and grown a great deal since its inception in late 2012. Detractors like to characterize this change in scope as “feature creep,” but Chris Roberts sees it as one of the advantages of working without a traditional publisher - being free to explore “the better idea” without pressure to deliver a locked feature set by a certain deadline, and unable to change plans when a revolutionary idea falls in your lap. One of those revolutionary ideas that has drastically altered the scope of Star Citizen is its procedural planet system. Fully rendered and explorable planets were never part of the original vision for the game; the intention was - until relatively recently in development - that players would be locked to a handful of predetermined landing zones on each planet, perhaps only one or even none on less populated worlds. Think of these landing zones as “hubs” from a traditional RPG, such as Mass Effect’s on-foot areas. Arriving at these hubs would involve a scripted landing sequence where a pilot loses control of his or her ship as it is guided down to the appropriate parking spot, after which you would be free to explore the area on foot before leaving again - presumably via a scripted launch sequence that would return control to the player once they were safely away from the planet. The idea that players would be able to navigate the surface of these planets outside of these landing zones (and perhaps a few hand-crafted “exploration” areas, chunks of wilderness created to host missions) was not in the cards, at least not for Star Citizen’s launch. Fans who speculated about roaming across vast planetary surfaces were quickly corrected by those of us who knew “better” - myself included. As I said on multiple episodes of The Base’s Friday Night Show, allowing players to navigate outside of landing zones and predefined mission areas was simply not feasible in a game like Star Citizen. It would not be reasonable to maintain a satisfactory level of fidelity across a space so vast - not to mention fill all that empty land with content for the players to interact with. We were right, at the time. One of the crowdfunding campaign’s stretch goals, the 41 million dollar goal to be precise, was funding a Procedural Generation R&D Team. 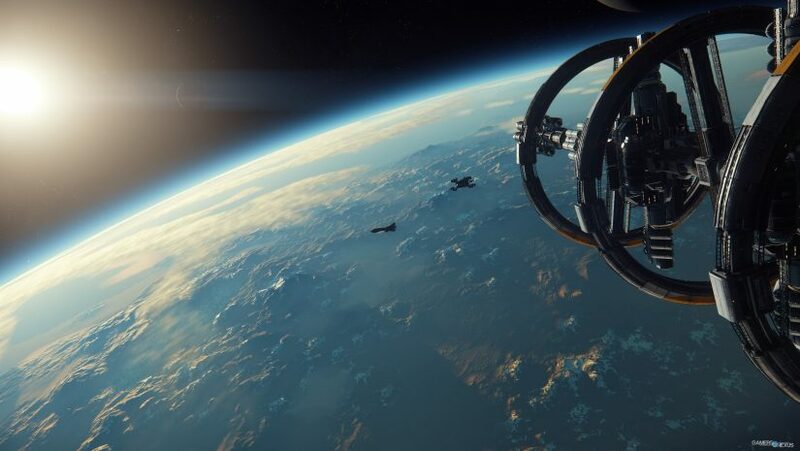 By reading the text pertaining to that goal, reached in April 2014, we can see that at the time CIG viewed procedural planets as a goal reserved for the far future of Star Citizen. “Procedural Generation R&D Team – This stretch goal will allocate funding for Cloud Imperium to develop procedural generation technology for future iterations of Star Citizen. Advanced procedural generation will be necessary for creating entire planets worth of exploration and development content. A special strike team of procedural generation-oriented developers will be assembled to make this technology a reality." Over the next year however, things changed dramatically. By December of 2015, plans for the use of procedural generation had completely changed the scope of the game’s planets to the point that they would indeed be just that: fully realized, fully rendered and fully explorable planets. On the Holiday 2015 Livestream, Cloud Imperium Games shattered expectations with its “Pupil to Planet” video, followed by a live demo featuring a player transitioning seamlessly from a space station to the surface of a planet, all without any loss of control, and the freedom to move wherever he liked. This change had huge implications for nearly everything players could participate in inside the Star Citizen universe. Full, explorable planets were going to be a reality - and not at some theoretical point in the far future of the game’s life cycle. They were coming now. Since revealing their intention to include procedurally generated planets as one of the core aspects of Star Citizen’s development going forward, we’ve seen a number of updates that highlight the technology. At the German gaming event Gamescom in August of 2016, CIG showed a demo of the upcoming Alpha version 3.0 which featured a Freelancer crew undertaking a story-based mission which took them from an orbital space station to a planet, back into space, and finally to an out of the way outpost on a nearby moon. Then, at CitizenCon 2016 in October, we saw a presentation of what CIG called Procedural Planets v2, which included a flyover of a complex and beautifully rendered planet with varied landscape features and culminated in a first-person adventure in one of the planet’s desert-like areas. This demo also included planetary weather in action as a sandstorm forced the player to take cover for its duration, as well as one of our first looks at fauna we might find in the universe, as a giant, Dune-inspired sandworm appeared to threaten the player and the NPC nomads populating the area. Now that we know that fully realized planets are part of the plan, what can we expect from them? As with many aspects of Star Citizen’s future, this is very much an open question. In the Procedural Planets v2 demo we saw a variety of Earth-like environments - grasslands, rolling hills, mountains, oceans, and deserts to name a few. From other demos we’ve seen rocky moons and more exotic environments such as a planet pockmarked with steaming, sulfurous pools. These examples only scratch the surface of the variety of locations CIG’s artists and designers will be tasked with creating, though - take a quick browse through the ARK Starmap and you’ll find descriptions of enough drastically different and challenging environments to make any artist rethink whether creating this sheer amount of content is possible within a reasonable time. So, how will they accomplish this? The easy answer (relatively speaking) would be to plug in some variables and let the computer do the work, creating “pure procedural” planets. We have a recent, and for many, painful example of how this approach can often produce less than adequate results, however. When No Man’s Sky released earlier this year, players quickly discovered that while the game’s procedural engine could on occasion create stunning vistas, more often than not the results ranged from simply uninteresting to ugly and nonsensical, with most planets turning out to be little more than barren rocks with very random landscape features and cut-and-paste outposts plopped down with no rhyme or reason. For the sake of disclosure, I’ll note here that I purchased No Man’s Sky and enjoyed it for what it was, but ultimately requested a refund because of what it wasn’t. CIG’s solution is to blend procedural generation with an artist’s touch, taking the raw procedurally generated planets and customizing them to their liking. As we saw in the CitizenCon demo (jump to 1:56:40 for a demonstration of these tools in action) CIG is creating a suite of tools to allow their team to tweak and customize the planetary environments to their liking - whether that means literally moving mountains and shifting entire landmasses or individually placing buildings and carefully managing the exact orientation of a single piece of rock. Their chosen method does have some limitations - one that they’ve spoken of is the choice to use heightmaps rather than a voxel-based system. As heightmaps are limited to a single Z axis, this means that whenever the design calls for a more complex vertical space such as a cave, overhang, or any environment with multiple levels of depth, an artist will need to create those assets by hand. Even so, this combination of procedural and artist-driven creation should ensure a coherent and pleasing result, and is many times more streamlined than crafting every inch of a world by hand. When you take into account the number and variety of worlds they need to create, though, it’s still a startling amount of work. One question CIG hasn’t yet answered is how all this will apply to dense, heavily populated planets like Earth, Terra, and ArcCorp - in this last case, the entire planet is supposedly enveloped in one gargantuan metropolis. It’s one thing to allow players to traverse sparse worlds that may have a few cities and the occasional outpost in between, but is it realistic to expect the same from more populated worlds that should contain an extreme amount of developed land? My prediction is that these planets will have “airspace regulations” and remain restricted, functioning more like the originally planned model - allowing players to land at designated sites, and disallowing travel outside of those locations. As I documented earlier, though, I’ve been wrong about planets in Star Citizen before, and I’d be more than happy to be proven wrong again. So now that CIG has embraced procedural technology and provided its artists and designers with the tools to craft these worlds to their liking, what exactly will they fill these worlds with? Aside from the aforementioned “city planets,” how will they manage to fill an entire planet with compelling content for their players - and not just one planet, but hundreds? Some of the available space will obviously be taken up by cities, and other areas will be set aside for mission or “quest” content. But if it’s not realistic to expect these hand-crafted areas to take up the whole of the available space - and, it’s not - then what does go there? What keeps the vast majority of Star Citizen’s planetary real estate from being empty, meaningless land devoid of content? We’ll explore one possible answer to this question in the second part of this series: Homesteading. Zhane is a freelance writer with a passion for games. (And science fiction, comics, and pro wrestling. Yep.) His UEE Citizen number is 749, so it's pretty likely that he's been waiting for Star Citizen longer than you have. He's also one of the managers of The Base, a 24/7 online radio station made by and for Star Citizen fans. If for some reason you might want to follow him on Twitter, you can do so @Zhane1138.